CIT Relay & Switch Offers a broad-line of UL approved and automotive relays. 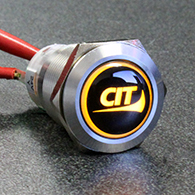 From low current applications up to 80amps, CIT can support your requirements, including UL approved latching relays! We also provide the necessary sockets. To choose the best relay for your application, contact CIT today! CIT Relay & Switch Offers a broadline of sealed illuminated anti-vandal switches. Ranging in size from 12mm up to 40mm, our styles offer ring and dot illumination, the international standby symbol or non-illuminated options. Mushroom actuators along with raised or flat actuators give the design engineer a multitude of options. IP67 sealing is available along with a choice of body and actuator colors including stainless steel, nickel and anodized aluminum in black, red, yellow, green or blue. 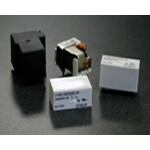 CIT Relay & Switch offers the J115F Series 50amp relay with UL approval and shorter than industry average lead-times. The rugged J115F Series has high dielectric strength coil to contact up to 4000Vrms. Heavy contact load is a hallmark of this high performance relay. 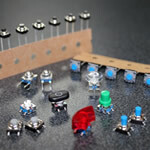 Robust in a small package, the J115F 50amp Series relays are UL F class rated standard. Process sealed switches offer dust tight housing with protection against splashing water, low pressure water jets or temporary immersion up to 1 meter with sealing degree reaching up to IP67. Also available with some series are protective splash-proof boots. See individual series types to determine sealing degree. CIT Relay & Switch is now offering Coded Rotary DIP switches in two sizes. The 7mm RD07 Series is sub-miniature in size, offering a flush arrow, 4.9mm knurled slot or 4.2mm flat slot actuator style option with three positions from 4 to 16. The RD10 is 10mm in size with five positions from 4 to 16. Actuator style options for the RD10 are flush arrow or 7.3mm knurled arrow. Both the RD07 and the RD10 are IP67 process sealed with code options of Real Code or Complementary Code. Available with multiple terminal options, both the RD07 and the RD10 offer packaging options of tube or tape & reel. CIT Relay & Switch Offers a broad-line of UL approved and automotive relays. 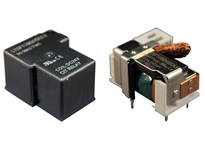 From low current applications up to 80amps, CIT can support your requirements, including UL approved latching relays! We also provide the necessary sockets. To choose the best relay for your application, contact CIT today! We will work with you to determine your best options and provide you with a high quality, competitive solution for all you relay needs. CIT Relay & Switch offers two automotive relays with shorter than industry standard lead time and better than industry standard pricing. The A6 Series automotive relay for sale is small in size and light weight. Offering low coil power consumption, switching current is up to 30A with contact arrangement choices of 1A or 1C. Coil voltage options for this relay are 12VDC or 24VDC with coil power of 0.9W or 1.3W. The A6 Series is 22.5 x 15.0 x 25.2mm. capacity up to 10A in a small and light weight package. Measuring 18 x 10 x 15mm, the J097 Series has 1C contact arrangement with coil voltage options from 3VDC up to 48VDC with coil resistance of .45W. PC pin mounting is standard. Contact CIT today for more information. CIT Relay & Switch offers a broad line of sealed illuminated anti-vandal switches. With IP67 sealing available, our styles offer ring and dot illumination and non-illuminated options. Raised and flat actuators are available on most series with mushroom actuators available on some giving the design engineering a multitude of options. The ME Series is an IP67 process sealed tactile switch offering both through-hole and surface mount options with a 350gF actuation force. With actuator and housing of PA6T Polymide and silver plated stainless steel dome contact, the ME Series uses a silicon rubber internal seal providing truly sealed, one piece construction. Actuator color is standard black; contact factory for additional color options. The CSP Series is an IP67 process sealed sub-miniature pushbutton switch offering both single and double pole options with Off-On and On-(On) switch function. With gold plated contacts and 3.30mm non-threaded actuator, the CSP give you several pc pin mounting options. The SMS Series is an IP67 process sealed sub-miniature slide with a choice of single and double poles. Switch function options are On-None-On and On-Off-On with an actuator height of 2.80mm. Contact material is gold plated with termination option of pc pin or horizontal mount right angle pc pin. Standard actuator color is yellow with other options upon request from factory. CIT Relay & Switch is now offering our long life VM3 Series snap-action switch with a latching option. 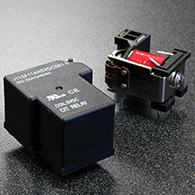 These UL/CUL recognized switches are available the 0.187” or 0.250” termination. Available with operating force of 400gF, common applications for the VM3L latching switch include industrial controls, lighting, security, gaming, automation and more. CIT Relay & Switch offers the J115F1, J115F2 and J115F3 series with ratings from the 30amp low cost economy (E) version to the robust 50amp heavy duty version. The rugged J115F Series offer high dielectric strength coil to contact of up to 4000Vrms. Heavy contact load and HP ratings are hallmarks of this performance relay. CIT Relay & Switch is now offering our C100 Series contactors. Available in double and three pole styles, the C100 Series offers high quality while maintaining cost-effectiveness. This UL/cUL certified contactor offers a convenient mounting plate with heavy duty contacts to ensure long electrical life. 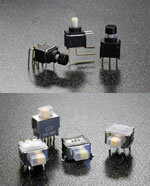 CIT Relay & Switch offers the FH Series in a small but robust package size of 12mm. This panel mount switch line is heavy-duty and rugged in construction - both splash and vandal resistant. The FH series is available as momentary in SPST. Flush and raised actuator styles offer nonilluminated, bi-color ring illumination or dot illumination. The CIT Relay & Switch miniature VM3 and the sub-miniature SM3 Series snapaction switches offer a choice of SPST or a SPDT circuit. 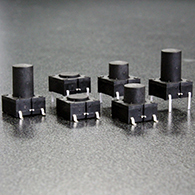 These UL/CUL recognized switches are available in 0.110" quick connect, solder lug, PC terminal and right angle PC termination. CIT Relay & Switch introduced our UL Approved Anti-Vandal family of switches with IP65 sealed pushbutton styling. Our AHU and DH22U series offer both ring and dot illumination and non-illuminated options. Choices of body and actuator color include Stainless Steel and Anodized Aluminum in Black. CIT Relay & Switch offers a tactile family of switches with lighted, sealed, thruhole, right angle and surface mount terminal options with a multitude of choices in cap styles, many of which are available with and without LED hole and several optional frames. 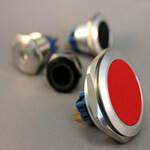 Our extremely versatile tact switches provide design engineers with several LED color choices. Bi-color choices make endless the combinations and applications for these popular switches. Non-lighted versions are also available with multiple cap and frame color combinations. CIT Relay & Switch offers the J115F1 series with a 40amp rating. The rugged J115F1 has high dielectric strength coil to contact of 4000Vrms. Heavy contact load and HP ratings are hallmarks of this high performance relay. Small in size and robust, the J115F1 is TÜV and UL certified and RoHS compliant. The CIT Relay & Switch Anti-Vandal family of switches offers IP65 sealed pushbutton style in sizes ranging from the 12mm EH Series up to the 40mm DH Series. Styles offer both ring and dot illumination and non-illuminated options. Choose the EH Series for a rounded convex actuator or the AH, BH, CH or DH Series for a flat actuator. Choices of body and actuator color include Stainless Steel, Nickel and Anodized Aluminum in Black, Red, Yellow, Green or Blue. Our versatile switches provide design engineers with several LED color choices. Bi-color choices make endless the combinations and applications for these popular switches. The Illuminated Pushbutton Family of switches offers sealed, thru-hole, right angle and surface mount terminal options with a multitude of choices in cap styles. 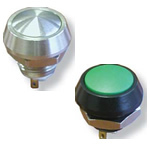 Our versatile pushbutton switches provide design engineers with several LED color choices. Bi-color choices make endless the combinations and applications for these popular switches.